Taylor is an Italian grey fabric sofa bed with a 14 cm high and 200 cm long sprung mattress. Available in XL single to king size models. Armrests with decorative buttons. 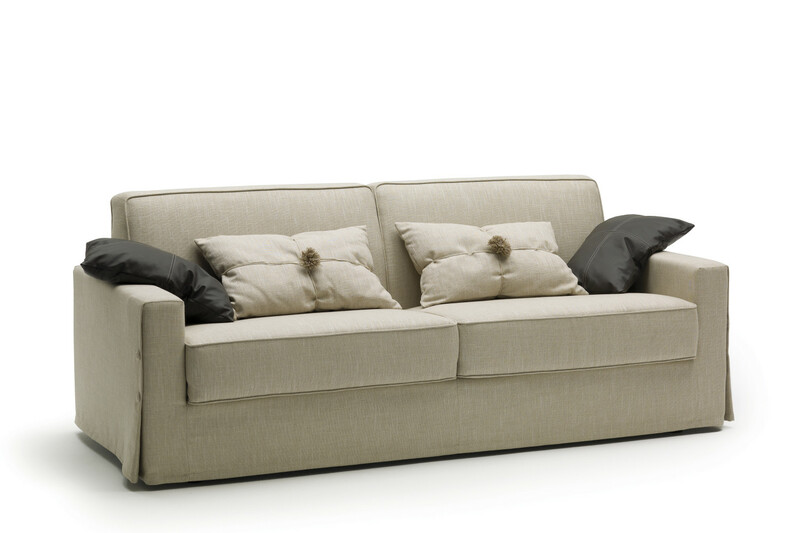 Taylor is a grey fabric sofa bed with a 14 cm high and 200 cm long mattress. It is available in several dimensios that turns in XL single, French double, double and king size beds. 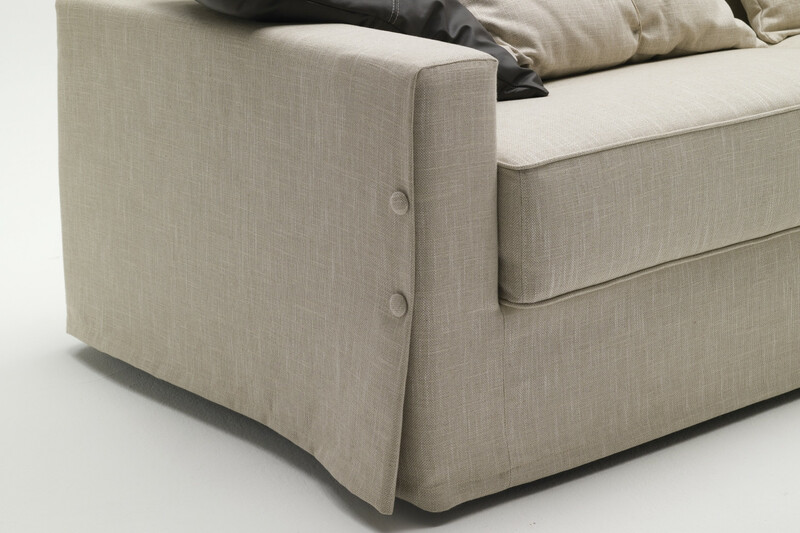 The sofa look is enhanced by its armrests with decorative buttons on the side, a detail that makes it perfect for classic and romantic sitting rooms, but also for more casual and modern environments: the wide range of fabrics and colours available, allows in fact to give the sofa the style you prefer. Taylor is equipped with a Lampolet mechanism that makes it possible to open it in a quick, easy and safe way. 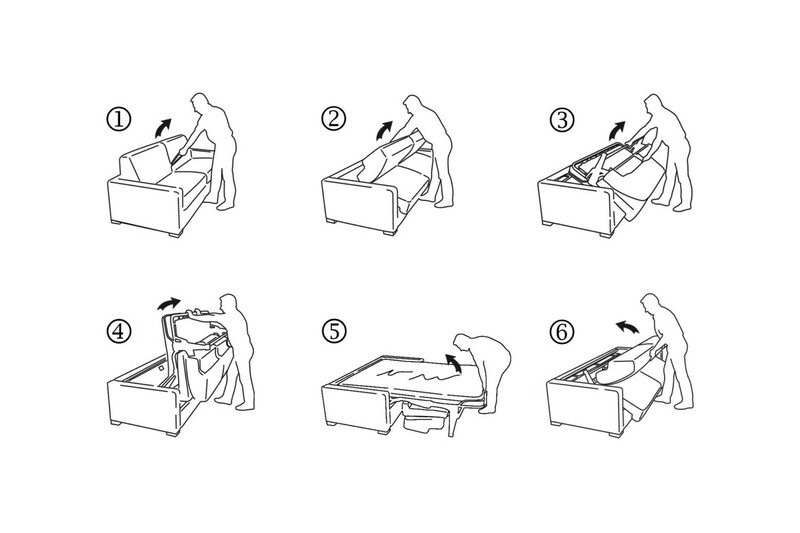 To open the bed base and the mattress, you only have to tip the backrest over the floor and lower the base holding its frame. 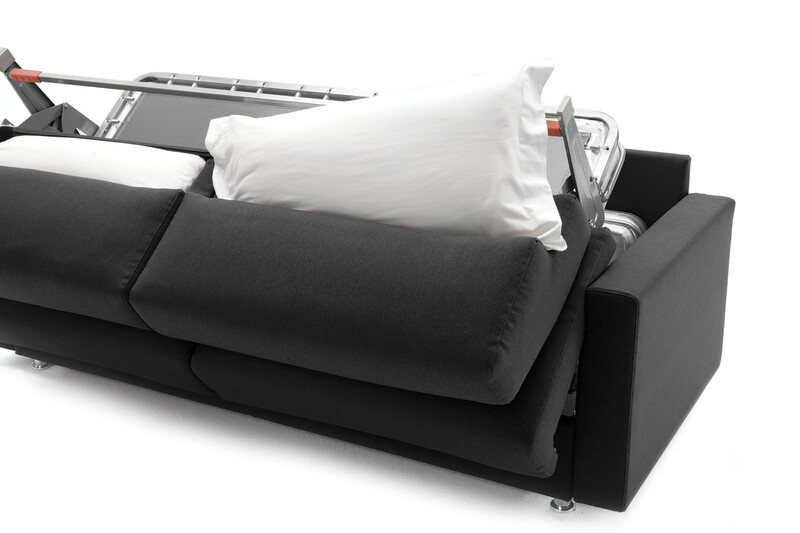 The bed can be closed in the same way, and you never have to remove the backrest and seat cushions. 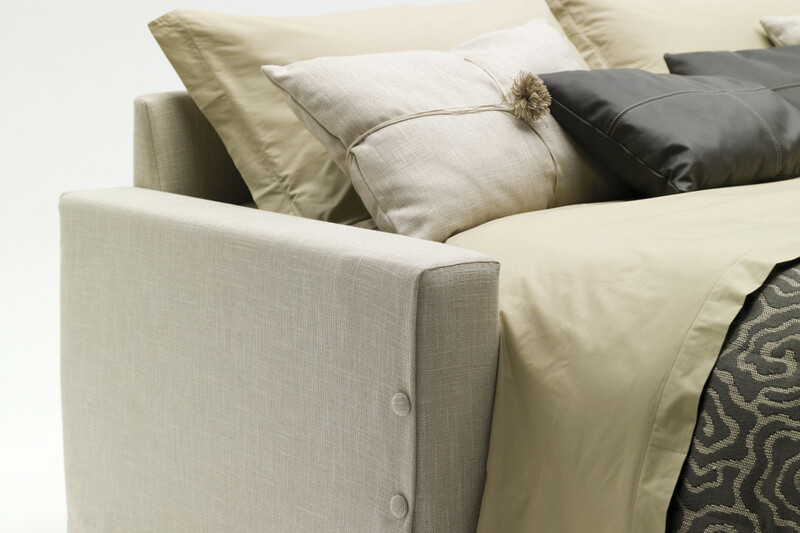 The bed pillows can be stored in a handy pillow holder compartment hidden in the backrest. 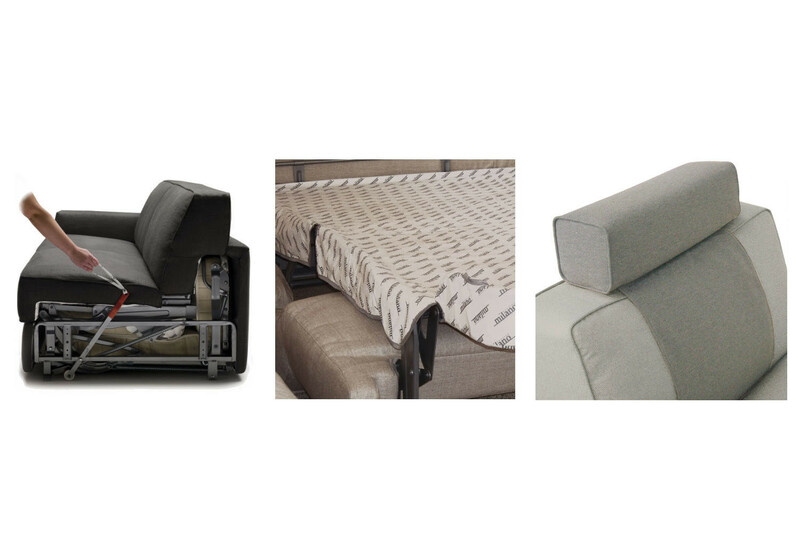 Instead of the the standard sprung mattress, it is possible to choose among a wide range of models the one that best suit your needs in terms of comfort and support. All models include a Standard h.12 mattress with Bonnel biconical springs. As an alternative, several other models with pocket springs, in expanded polyurethane and latex are also available. 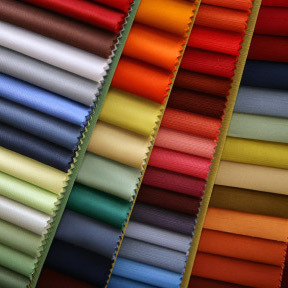 Fabric cover available in several colours displayed in the samples page. Taylor cover is completely removable. Standard mattress:“Bonnel” springing in tempered steel with a diameter of 2,20 mm; a 25 Kg/m³ expanded polyurethane layer on top and bottom; 100% cotton fabric quilted with g 200/m² 100% PL resin fibre and nonwoven fabric; quilted side with aerators; tape edge. Frame: backrest in high resistance furniture tube, oven coated with epoxy powders. Armrests in fir wood, poplar plywood and particle wood. Headboard in particle wood, fir plywood and solid fir wood. Seat: 35 kg/m³ expanded polyurethane, covered with 100% PL wadding combined with 280 gr/m² interliner + mm 2,5 quilted interliner. Headboard and Panel: interliner combined wit mm 10 expanded polyurethane.